Today we are looking at King Of Avalon published and created by Diandian Interactive Holding. 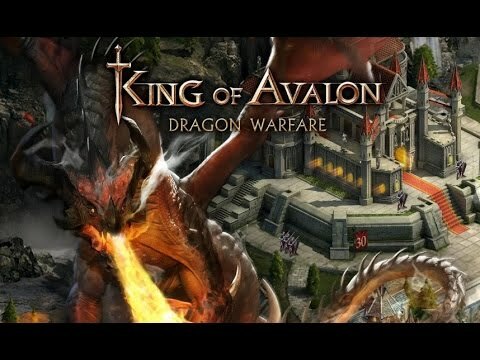 What King of Avalon offers is the chance to build a city and army to wage war against monsters and other enemies. There are lots of buildings to erect and upgrade, including farms and sawmills, military tents and hospitals, as well as an embassy and even a wishing well. You can also train troops in three different buildings. As you level up, you’ll unlock up to ten types of cavalry, infantry, and bowmen. In addition, there are numerous siege weapons and traps to construct. Your city also includes a university in which you can conduct research involving development, combat, the economy, and defense. And although you only get one dragon, you can upgrade its skills. Of course, to upgrade buildings and upkeep your troops, you’ll need resources. You can generate food, wood, iron, and silver from farms, sawmills, and mines within your city, as well as gather them from other locations in the kingdom. Additionally, you can win such resources, and more, through defeating monsters and attacking other cities. A good number of items, such as scrolls, are available for collection, which you can use to forge armor and weapons. To get maximum fun out of this game, it’s recommended that you participate in an alliance. This will allow you to work together with other players to grow a bigger empire, not only in numbers but also through constructing alliance buildings and donating food and other resources toward various upgrades. Let`s take a look over the gameplay and see what we have here. Aside from the disappointment of having only one dragon, King of Avalon offers little in terms of strategy. Battle animations are also really simplistic. Basically, attacking an enemy involves marching to a specific location on the kingdom map, where you’ll watch the battle take place with absolutely no control over troop placement or anything. Winning seems to be a matter of having the minimum level of troop power. Since this is a free MMO game, there’s a lot of waiting time involved in upgrading buildings, training troops, as well as marching to gather resources and attack enemies on the map. You can shorten the time needed through timer speed-ups or by paying gold (available in the game and through IAP). Most unfortunately, however, you can only have a maximum of two builders, only one of which is free. You can unlock the second builder for a time-limited period by either paying gold or using a sort of power-up. I was a little disappointed because I was thinking that there will be more dragon action and etc. After all, this is a strategy game, and there is a chance to be liked by some of you.